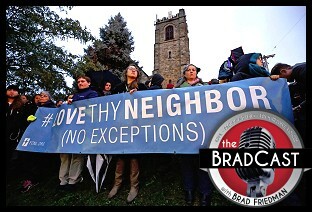 " 'Trump's Reichstag Fire' and the Deadly Menace of GOP Hate Mongering: 'BradCast' 10/30/2018	"
« PREVIOUS STORY "'Green News Report' - October 30, 2018"
"'Trump's Reichstag Fire' and the Deadly Menace of GOP Hate Mongering: 'BradCast' 10/30/2018"
I early voted on Saturday in Houston and the only thing that flipped was my democracynow t-shirt, which a poll worker said I had to wear inside out. I have had the pleasure to write a couple articles for the Hispanic LA site. My newest is largely about voter-suppression, and in it I refer to both YOU and Greg Palast as valuable sources on voting integrity issues.